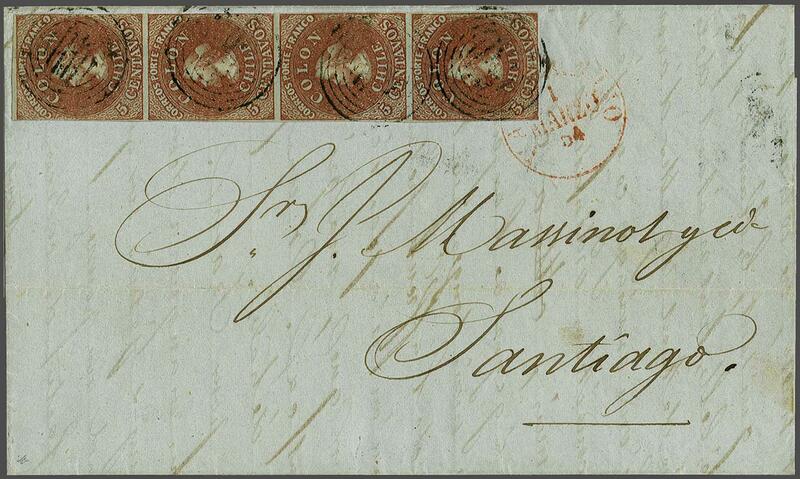 London Printing 1853 (July 1): 5 c. red-brown on blued paper, a vertical strip of four used on 1854 second sheet of entire letter from Valparaiso to Santiago at 1 ounce rate, margins good to touched, neatly tied by barred target handstamps in black with 'Valparaiso' cds in red at right (March 1). A fine and extremely attractive #1 cover: just two covers are recorded with strips of four on letter, this being the unique vertical strip. Cert. Corinphila (1996).rnProvenance: Collection 'Islander', Corinphila sale 95, Dec 1996, lot 781.